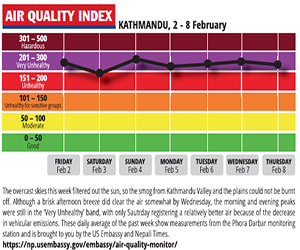 Central Nepal and Kathmandu Valley are going through their second monsoon after the April 2015 earthquake. The pace of reconstruction of homes, monuments and heritage sites has been frustratingly slow. In six out of seven World Heritage Sites in the Valley that saw extensive damage, rebuilding has not even started. In this fourth edition of the Nepali Times Heritage Live! Series, we try to find out why. One of the reasons is so fundamental that the process will not pick up speed until it is addressed: it has to do with how authentic we want the reconstructed sites to be. Authenticity is tricky because over the years heritage conservationists have employed different methods in reconstruction, taking into account the architectural idiom of Kathmandu Valley and conservation methods employed in past decades. Conservation architect Sudarshan Tiwari describes Kathmandu Valley’s unique architectural form as “distinctive construction and craftsmanship in the brick and wood of the tiered temples”. Exquisitely carved they may have been, but they had to face two destructive forces: earthquakes and monsoons. Kathmandu’s private and public buildings were designed to safeguard against them. For instance, the deep overhang of the pagoda structure was a conscious design choice to keep out the rain from the brick-mud mortar walls of tiered temples. Our forebears also developed ingenious methods to protect the monuments from earthquakes, with wedged joints between wooden members and brickwork to add structural integrity. Kathmandu’s early builders adapted building technology to contextual challenges, but recent reconstruction disregarded these in renovation and conservation efforts. Such restoration in past decades introduced a host of new material to our monuments. 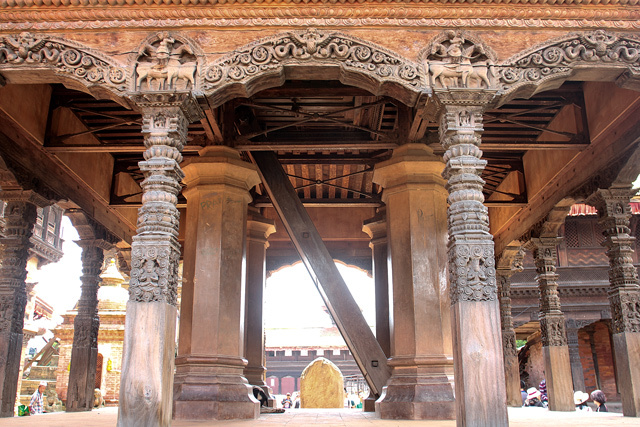 The reconstruction of the Chyasilin Mandap — carried out in 1989/90 with German technical and financial assistance — introduced a steel frame for structural support, and steel trusses were also used in the restoration of the Patan Darbar and Museum . Similarly, reinforced concrete also found its way into our traditional structures. These architectural methods opened the floodgates of debate. Reaction from heritage conservationists to such additions ranged from the mild “not really needed” to an outraged “grave mistake”. Rabindra Puri, the heritage conservationist who has struggled to save the traditional architectural fabric of Bhaktapur, falls somewhere in between, but even he thinks modern materials should not be allowed in the reconstruction of public heritage structures. “The use of such materials isn’t justified,” he says. “You cannot just look at a few fallen structures and point out that our traditional methods failed, when other equally older monuments are still standing like Nyatapol in Bhaktapur and Indreswor in Panauti.” He adds that a blanket conservation approach should not be applied to all monuments based on one example of a damaged heritage site. It gets trickier still, because international conservation charters can be interpreted to justify the use of modern materials in the reconstruction of Malla-era buildings. 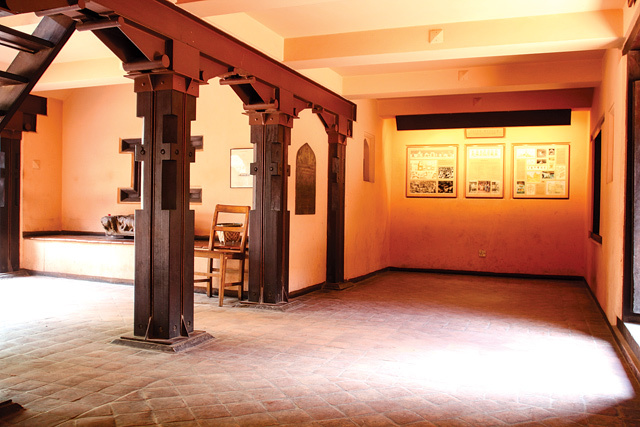 For example, it can be argued that the use of steel truss supports in the east wing of the Patan Museum is justified because of the adaptive re-use of the building as a museum. The newly opened building has to be structurally strong enough to accommodate additional visitor footfall, which would not be necessary if it were just a renovated palace complex. 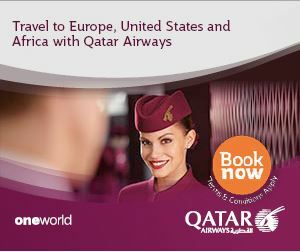 The debate is focused on authenticity of materials, and not form or other intangible aspects of our heritage. And, while it is easy to get all worked up about this, it is important that we agree that both sides are advocating the same thing: better reconstruction of heritage sites, and efficient conservation policies. What we need is a system that respects our traditional conservation ethos, and allows space for modern materials to strengthen the structures without altering the spirit of our architectural heritage. Learning from the past, this time around, the Department of Archaeology has tried to do so. They have introduced reconstruction guidelines that favour a traditional approach but do not give modern methods the cold shoulder. These methods can be introduced during reconstruction, provided they are scientifically warranted and approved by the department. 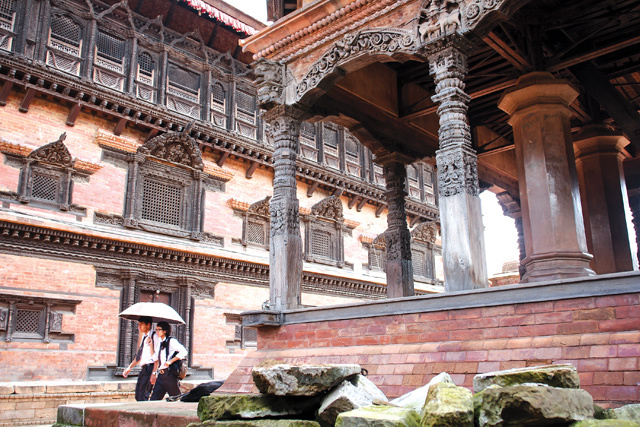 The 55-windowed palace and the Chyasilin Mandap sit near each other in the same square in Bhaktapur. Both are exquisite specimens of Malla-era architecture, and add to the outstanding universal appeal of the palace square. And both monuments highlight a distinct conservation approach. Unlike the Mandap, the palace was restored in 2006 largely employing traditional methods. Though it did introduce an additional timber element as structural reinforcing, it follows the ways our craftsmen and artisans have always employed through centuries of trial and error. “We had to show that our methods work too,” says Prem Nath Maskey, a structural engineer and a member of the team that oversaw the palace renovation. The Chyasilin Mandap introduced a steel frame for structural support. The jury is out on which approach is better when reconstruction begins. The post-1934 reconstruction of temples and monuments hold many lessons for rebuilding after last year’s earthquake. Many historical structures were simply left in ruins, and some that were rebuilt employed styles that were not traditional. Numerous tiered temples of Kathmandu, Patan and Bhaktapur were restored with Mughal-influenced stucco domes like the Krishna temple in Swotha of Patan. The Bhai Dega temple in Mangal Bazar used to be an elegant pagoda temple before it was destroyed in 1934, but it was rebuilt to look like the Taj Mahal. It is now being restored along its pre-1934 lines. While it is likely that reconstruction will take time to get off the ground, it appears that this time Nepal has enough architects and urban planners who understand heritage conservation. The world is watching us, and local communities are enlightened enough not to allow architectural travesties to occur this time. "I am not in favour of an ethnic state"